Aniplex of America is excited to announce the home video release of the hit fantasy anime series Record of Grancrest War featuring a brand new English dub! Based on the light novel series by acclaimed author Ryo Mizuno, who is best known for the fantasy novel series Record of Lodoss War, which has 10 million copies in print, Record of Grancrest War premiered in January of 2018. Mr. Mizuno himself worked on the series composition alongside Shunsaku Yano (Phantom in the Twilight), taking fans on a journey filled with epic battles, political intrigue and engaging characters. Production is handled by the esteemed studio, A-1 Pictures (Blue Exorcist, Sword Art Online, ERASED) with Mamoru Hatakeyama (Kaguya-sama: Love is War) as the director. The complete series will be available in two volumes both with a beautiful rigid box with illustrations by the illustrator of the original works, Miyuu, along with a booklet, web previews and textless openings and endings. Volume 1 will be available on April 23, 2019 while Volume 2 is scheduled for release on August 20, 2019 with pre orders opening today on RightStuf Anime. 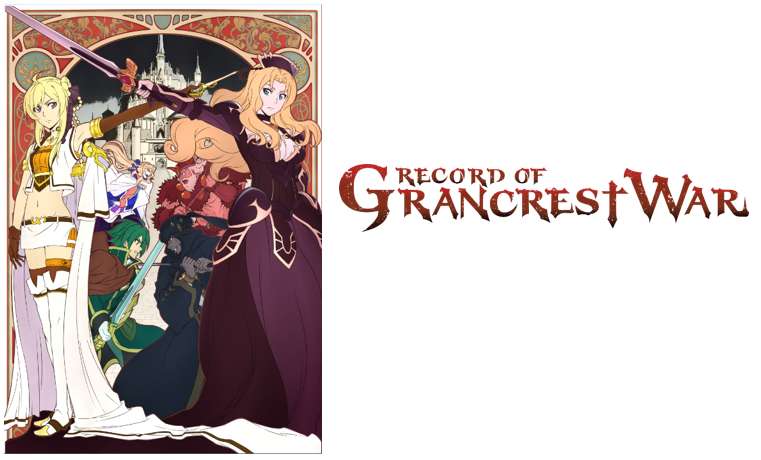 Lauded as the “greatest record of war fantasy,” Record of Grancrest War became one of the most highly anticipated series premiering in the winter 2018 season with self-proclaimed Ryo Mizuno fan, Fumiaki Maruto, (Saekano: How to Raise a Boring Girlfriend) expressing his excitement, meanwhile Tomihiko Ito, the director of the first two seasons of Sword Art Online, calls it the “Japanese Game of Thrones.” The Japanese voice cast stars Kentaro Kumagai (Charlotte, Fate/Grand Order – First Order -) and Akari Kito (ERASED, BLEND-S), alongside all-star heavyweights Yuichi Nakamura (Durarara!! series, The irregular at magic high school franchise), Satoshi Hino (Magi: The Kingdom of Magic, The irregular at magic high school THE MOVIE – The Girl Who Summons the Stars -), Yoshitsugu Matsuoka (Sword Art Online, Eromanga Sensei), and Ai Kayano (anohana - The Flower We Saw That Day -,March comes in like a lion). The show’s opening and ending themes were performed by Mashiro Ayano (Fate/stay night Unlimited Blade Works, Re:CREATORS) and ASCA (Fate/Apocrypha, Sword Art Online: Alicization), who each contributed two songs for the opening and ending themes for the first and second cour of the series.